1. 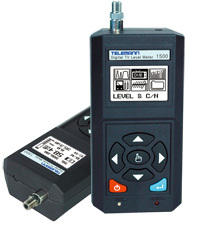 DIGITAL TV LEVEL METER 1500series? The optimal signal analyzers to test and measure both analog/digital signals. Especially, these models give users the capacity to measure 'C/N' very easily and correctly, which are very important measurement factors for the TV broadcasting signal. Power turns off automatically when it has remained inactive for a period time of conserve battery life. CH PLAN can be uploaded/downloaded with PC.